We strive to disciple people to faith by sharing the good news about Jesus with those who do not yet know him. By providing Biblical teaching and enabling people to grow in their relationship with Jesus through worship, community and service. To send people out into all the domains of their lives equipped to be a redemptive influence as they live like Jesus and actively promote the Gospel and Christian values. A disciple is a person who has been saved by God’s grace and who is, in response to God’s grace, passionately committed to following Jesus Christ in a joyful life of personal devotion, corporate worship, significant community, sacrificial service and redemptive influence. These five traits are non-negotiable and all play a vital and equally important role in our individual growth and fulfilment as followers of Jesus Christ. Our Mission as a church is represented by the idea of “Moving People to the Right”. We want everyone who is a part of our church community to be connected and growing in maturity as they come to know and follow Jesus. Everything we do as a church can be found within the steps below. 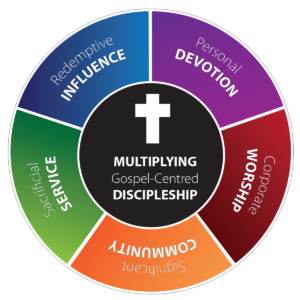 At its heart, these steps represent the way that all our different ministries function together to move each of us towards greater maturity in Christ so that we can become multiplying disciples of Jesus in the places where we live, work and play. We are intentional about inviting friends, family and colleagues to join us at church to learn more about Jesus. We strive to be a warm and friendly church where guests will feel genuinely welcomed and valued. Our worship services are designed to be God-glorifying and engaging for a diverse community. We are a place where people can find new friends and enjoy community. Our members are connected in smaller groups where they can be discipled and find significant community. We care for one another and our community through using our gifts and personal service. Every member is sent out to be a redemptive influence in the world in the places where they live, work and play.